With these words, one of popular music's most recognisable, celebrated names of the past forty years - Agnetha Fältskog - signals her return to the spotlight. The siren songstress from ABBA returns with a new album 'A', due for release on May 14th and preceded by a curtain-raising track, 'When You Really Loved Someone'. Agnetha has been working with renowned, Grammy-nominated songwriter/producer Jorgen Elofsson - who has been responsible for hits by Britney Spears and Kelly Clarkson among others - and acclaimed producer/arranger Peter Nordahl. 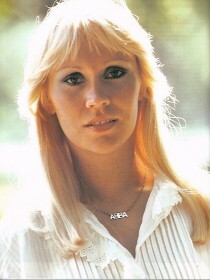 The album features 10 tracks, including 'I Should've Followed You Home' - a duet with Gary Barlow - and 'I Keep Them On The Floor Beside My Bed', one of Agnetha's first co-writes in many years.